KCA was one of the lead designers for the three span, four lane replacement bridge near a recreational facility that outflows to Spring Creek, a popular local attraction for tubing. Due to limited right- of-way, and to provide ease of construction, functionality, and aesthetics, a system of steel sheet piles and bulkhead walls protect the foundations. The bridges cross the outflow canal of Merritt’s Mill Pond, which carries water to a control structure. 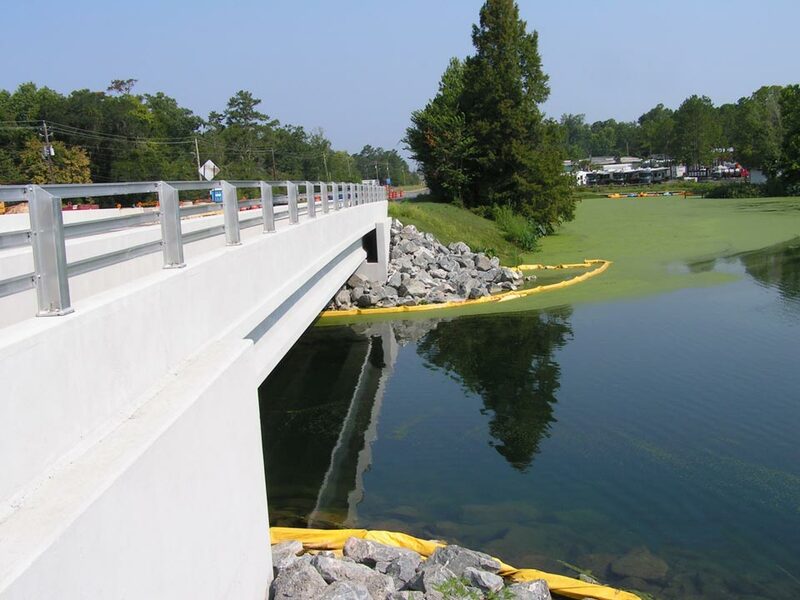 The water control structure maintains the elevation of the water in Merritt’s Mill Pond. Due to unique user interests and environmental concerns, it was imperative the operation of the water control structure and lake levels remained unchanged during and after construction. Services included public involvement and coordination with local businesses.